This page is probably Ben's biggest moment in the issue, when he takes the spotlight and busts free, so I picked it up on EBay (Jan '04), direct from the inker himself. Though I greatly respect Mark Gruenwald's editing skills, love his writing, and even enjoy his artwork occasionally (the first Hawkeye miniseries ain't bad! 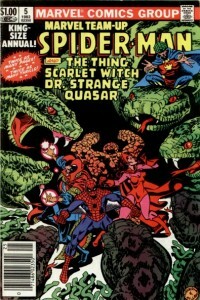 ), I have to concede that he struggled when drawing the Thing. Still and all, I love the giant Serpent Crown here, and like having the transition page where it comes into existence. 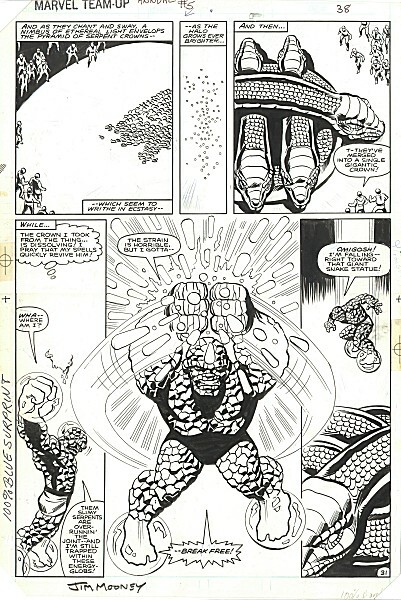 Despite flaws in Ben Grimm here, I very definately get a kick out of this page. I'd also like to note the presence of an astral Doc Strange in this page, as seen in the image scanned in here from the comic book. So as to appear ghostly, Doc has not been inked at all, and is pencilled in so faintly that I could not get him to show up no matter how I adjusted my scanner settings!